Back Row: David Sandusky, Rick Greenwell, Joey Spalding Middle Row: Ray Johnson, Susan McCain, Sr. Charlene Vogel, Joe Carpenter Front Row: John Settles, Sr. Charlene Moser, Danny Ray Spalding, April Donathan. In the rolling hills of Central Kentucky, there is a unique piece of Catholic history. The St. Catharine Motherhouse and its attached farm was the first mission of Dominican Sisters in the United States, founded in 1822. Today, the Motherhouse and the Sansbury Care Center is home to 82 Dominican Sisters of Peace. Looking out of the window from the Motherhouse, a visitor will catch a glimpse of St. Catharine Farm. Once providing food for the Motherhouse, today the Farm boasts 150 Angus beef cows, acres of grain crops, and a newly-renovated greenhouse expected to provide fresh produce to the residents of Sansbury Care Center throughout the winter months. But raising food is not the only mission of the Farm. In true Dominican fashion, St. Catharine Farm’s stated mission is show respect to the earth and to teach others to do the same. 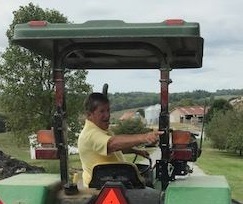 Farm Manager Danny Ray Spalding has been a driving force behind the Farm for nearly 34 years. Starting as a farm hand in high school, he now manages the Farm for the Sisters, and is well known in the local farming community. But running a beef farm is a pretty big job – and sometimes the work of today leaves little time to plan for tomorrow. In 2012, St. Catharine Farm put into place a plan to provide for long-term growth and sustainability. Part of that plan was the establishment of a Farm Advisory Council. Rick Greenwell (back to camera), Susan McCain, Danny Ray Spalding, Donna Vroom and Alice Black from Congregation Mission Advancement, and Sr. Charlene Moser, Founded Ministries Liaison meet at St. Catharine Farm. Diversity is a key word when describing the Farm Council. Before studying law, McCain worked for Eli Lilly and as an extension agent for the University of Kentucky. Council Vice-Chair John Settles is Washington County Judge Executive, and a beef farmer himself. David Sandusky is a Purchasing Manager for ATI Forged Products, and owns a beef farm in neighboring Marion County, and Ray Johnson is an owner/operator of an excavating company and a beef farmer. Both Joey Spalding and Joe Carpenter are members of the Springfield-Washington County Rescue Squad: Joey is also a loan officer, member of the Kentucky 4-H Foundation Board and a father of four, while Joe is a retired USDA Soil Conservation Technician and father of three. Dennis Morgeson is the Washington County Extension Agent for Horticulture, and Rick Greenwell was the Washington County Cooperative Extension Agriculture & Natural Resource Agent for nearly 50 years. Sister Charlene Vogel and staff members Donna Medley and April Donathan round out the group. 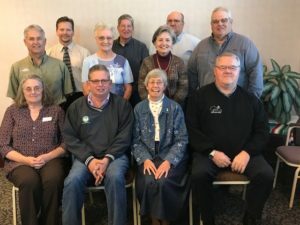 What this team has in common is a love of the land and a desire to see the Farm succeed, both financially and in meeting the mission of the Congregation. Sitting on the St. Catharine Council is not just an honorary position. 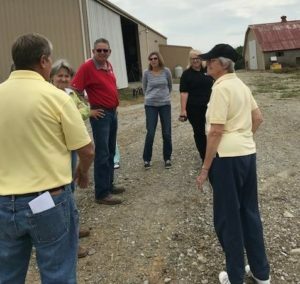 Members of the St. Catharine Farm advisory council meet quarterly, but they also participate in the activities of the Farm, from Field Days to exhibit farming technologies to meetings with consultants from the University of Kentucky, various contractors, and others working on projects on the Farm. As busy as each of the volunteers are, they find time to help Danny Ray and the Dominican Sisters of Peace identify innovative technologies to care for the cattle and the land. Advisory Council Member Rick Greenwell shares Farm history with guests as he drives a farm tractor. 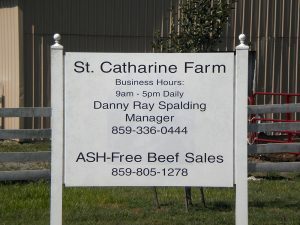 In the end, the true goals of those who serve on the St. Catharine Farm Advisory Council are the same as those of the Farm itself – to honor the land, to feed the hungry, to educate those around them about the benefits and importance of sustainable agriculture while raising healthy, nutritious beef. The members of the Council offer their time and talents to help us meet those goals. In the words of Council Member David Sandusky, “I think that God is proud of these people, and of the improvements being made on the Farm.” We would agree, and we are grateful for their dedication to our mission and our success.